Each year the Massachusetts Broadcasters Association gives out thousands of dollars in scholarships to the best and brightest college students in Massachusetts who are pursuing a broadcast related degree. In 2013, a former MBA Broadcasting Scholarship winner saw his career take a major step. A step into Boston. Matthew McCarthy, who graduated from Ithaca College in 2013, won MBA scholarships in back to back years in 2011 and 2012. 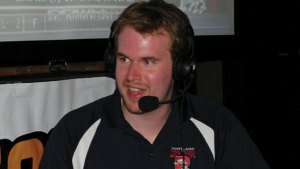 In July, McCarthy was proclaimed the winner of 98.5 The Sports Hub’s “Search for Boston’s Next Weekend Co-host,” winning a weekend shift on the top-rated Boston sports station. Mike Thomas, Vice President of Programming for CBS Radio Boston said that he felt that the Sports Hub had enough of a following to give this type of contest a try. The response was fantastic. According to Thomas, there were more than a thousand people that entered the contest at ten separate qualifying events. From there it was whittled down to a top ten, then top four, and McCarthy was ultimately crowned the winner. You can listen to his “hot sports takes” with The Sports Hubs Toucher and Rich here. McCarthy began his broadcasting career in college by working at student-run WICB-FM in Ithaca. His first paying job out of college was as the number two play-by-play broadcaster for the Double-A affiliate of the Boston Red Sox, the Portland Sea Dogs. McCarthy also recently joined Cape Cod Broadcasting in Hyannis as a news reporter. When asked how important young talent, like Matthew McCarthy, is to the future of The Sports Hub, CBS Radio and the industry in general, Mike Thomas said, “Very important. When we launched the Sports Hub one of our philosophies was that we were going to be looking to develop young talent… Guys like Marc Bertrand, Rich Keefe, Adam Jones [and] Hardy all had very limited experience until they started working here. Now, they are a big part of our line-up each week. The main goal of the Massachusetts Broadcasters Association Broadcasting Scholarship program is to help the future of radio and television broadcasting by helping the next generation of on-air talent, programmers, engineers, etc. With your help in 2014 and beyond we can help more students like Matthew realize their dreams of working in radio and television. Be on the lookout for 2014-2015 MBA Broadcasting Scholarship information early next year. For more information you can log on to MassBroadcasters.org. Families in Broadcasting Scholarship window is open! MBA Families in Broadcasting Scholarship apps available!